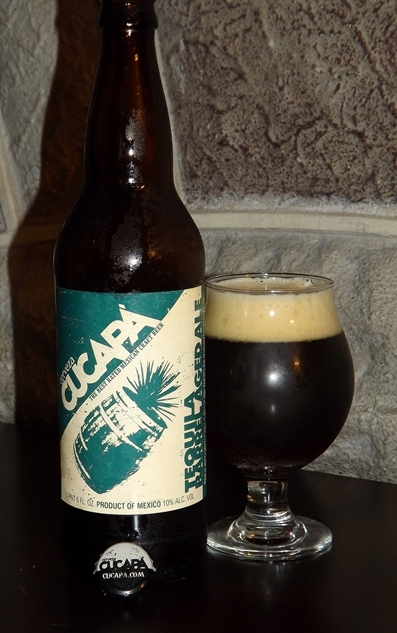 Billed as one of Mexico’s first microbreweries, Cucapa opened its doors in 2002. There isn’t a whole lot of information about the brewery out there, but it does hold the distinction of being the first Mexican brewery to score over 90 from the Beverage Tasting Institute for four of its beers. They also brew a wide variety of styles, including rye, pale ales, kolsch, imperial stouts, and of course, barrel-aged barleywines. I think this may be my first legit Mexican beer – Corona doesn’t count.. Talk about high hopes and setting the standard for an entire country. Honestly, I’m not even completely sure why I traded for this beer, since I don’t really like tequila (can’t say I’ve had any decent kind though), but I figured why not. Pours a dark mahogany brown color, cloudy and muddled but with enough to sustain a 1.5-fingered, tan head for a long while. It never fully dissipates but rather fades to a silky smooth coating that floats precariously atop the beer. Decent lacing that stripes the glass. I'm not really getting a whole lot of tequila in the nose. Instead, the aroma is rich with the more traditional barleywine notes; strong caramel malt, dark fruits, prunes, and a little bit of alcohol heat. I am getting a slight oakiness in the finish, but it's subtle. As it warms, a potent lime smell arises to give it that tequila punch. The taste is... unique to say the least. The first thing that hit me was an almost cloying sweetness due to an abundance of malts, which manifest as brown sugar, molasses, a pinch of caramel. The raisins and dates are starting to kick in and then... tequila. It comes with a vengeance for being forgotten in the aroma and crashes like a wave into my palate. At first, I am surprised, hesitant, and perhaps a little offended. 'This isn't very good. I won't finish this bomber.' I think. But then I come back to it, time and time again. The lime and citrus are stark contrasts to the prototypical barleywine flavors, but that only serves to help accentuate them. A description that keeps nagging at me is 'dried tobacco'. Even after the greater portion of a glass, I can't wrap my head around the finish. It is citrusy, slightly salty, and even strangely refreshing. I guess this is some agave coming into play. Either way, I am still amazed I'm describing a barleywine as anywhere near 'refreshing'. Mouthfeel is medium-bodied with good carbonation. A little lighter and thinner than other barleywines out there, this one embraces the lighter side to balance the wide variety of flavors. I wouldn't complain if it were a bit thicker though. Drinkability is moderate. Certainly one of the more interesting beers I've had, but can't say it tops any lists for me. I feel that if I delved more into tequila and appreciated the spirit more, I would hold this in similar regard to bourbon-aged barleywines, but as of now I still find it a touch harsh. This is somewhere around $8-10 for a bottle, which for a barrel-aged beer isn't a bad price at all. Factor in the rarity of aging a beer in tequila barrels and that helps it. While not my cup of tea, I'm sure the tequila presence would be more welcoming to those who love the spirit. Overall, I find myself flip-flopping on my impression of this beer. At first, I didn't think I'd be able to get more than a few swigs down, but it gradually softened as I became more accustomed to it. I was even looking forward to having the second half of the bottle the next day. This is a beer I'm going to keep on the backburner in case I ever delve into tequila territory so I can revisit it again. Worth a try if you are a tequila fan, but even if you aren't, it makes for a good, adventurous beer. Last updated by Greg Bruce at September 16, 2012 .